Aurora is an affluent town in York Region, approximately 20 km north of the city of Toronto. It is partially situated on the Oak Ridges Moraine, and is a part of the Greater Toronto Area and Golden Horseshoe of Southern Ontario. According to the 2011 Census, the town had a population of 53,203. In 2010, average household income in Aurora was $155,463, making it one of Canada’s most affluent towns. 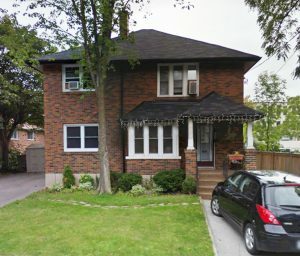 Growth is occurring in the north-eastern locations, particularly in the form of high-density residential homes and townhouses along Bayview Ave and north of Wellington St. E. (also known as “Aurora Rd.”), and commerce along Wellington St. E. on Aurora’s eastern border between Leslie St. and Hwy. 404. One other area of growth will be via intensification along the Yonge and Wellington Street corridors. Aurora is served by three publicly funded school boards: the York Region District School Board (the English Public Board), the York Catholic District School Board (the English Catholic Board), and Conseil scolaire de district catholique Centre-Sud (the French-language Catholic Board). Aurora residents have access to a wide range of other educational facilities including daycares and nurseries. The Aurora Public Library is a public library funded and operated by the town. Aurora’s history dates back to 1796, when it was a small crossroads community known as Machell’s Corners situated at the intersection of Yonge and Wellington Streets. This hamlet was named after merchant Richard Machell, who was one of Aurora’s first settlers. The town’s name was officially changed to Aurora in 1853, when the railway began service to this area ushering in the “dawn of a new age”. The railway brought great commerce and prosperity to Aurora which had earned village status by 1863, and then graduated to town status in 1888. You can learn much more about the history of Aurora at the Aurora Museum. This museum is situated in the former Aurora Public School building located at 22 Church Street. This stately Victorian building is designated under the Ontario Heritage Act. Former Canadian Prime Minister, and Nobel Peace Prize winner, Lester B. Pearson attended school here. Downtown Aurora, centred at Yonge and Wellington Streets, features an outstanding selection of heritage homes encompassing a wide variety of architectural styles including: Victorian, Edwardian, Regency Style, Itallianate, Greek Revival, Georgian, Colonial, and Tudor architecture. On the edges of the downtown you will find ranch-style bungalows, split-level homes, and two-storey detached homes built mostly in the 1950s and 1960s. 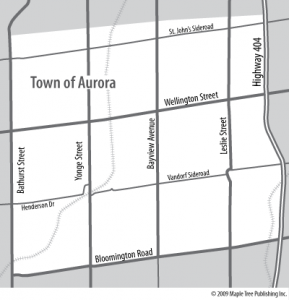 Aurora is well known for its new home subdivisions. The new housing in the downtown core has a higher density, and features a large selection of semi-detached houses and townhomes. On the outskirts of town, set amidst a pastoral landscape dotted with golf courses, you will find numerous executive style subdivisions with larger detached homes, on generous size lots. Downtown Aurora centred at Wellington and Yonge Streets is lined with charming 19th century buildings. This pedestrian friendly shopping district includes a good mix of retail shops, services and restaurants. Many professional offices are also situated here. Aurora contains a plethora of modern shopping plazas up and down the busy Yonge Street corridor. In particular the gentrified shops at the St. Andrews shopping centre located at Yonge Street and Orchard Heights are worth a visit. Aurora’s largest indoor shopping mall is the Aurora Centre located on Bayview Avenue, north of Wellington Street. This shopping centre is anchored by Zellers and Sobey’s. Aurora has over 45 parks that encompass almost 500 acres. 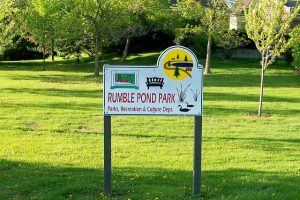 The largest of these parks is Sheppard’s Bush a 50 acre nature preserve operated by the Lake Simcoe Region Conservation Authority. Many of Aurora’s parks are linked by a trail system that is enjoyed by cyclists, walkers, joggers, hikers, and cross-country skiers. The Aurora Community Centre at 1 Community Centre Lane includes a 1600 seat arena that is home to the provincial Jr. “A” Aurora Tigers ice hockey team. The Aurora Leisure Complex located at 135 Industrial Parkway is a multi-purpose facility that includes an ice arena, fitness equipment, squash courts, meeting rooms, and an indoor leisure pool. Aurora also boasts 4 golf clubs, 9 tennis courts, 23 baseball fields and 36 Soccer fields. Library Square located at Victoria and Church Streets, just east off Yonge Street, is the hub of cultural and social activities in Aurora. This old fashioned town square is highlighted by the recently built Aurora Public Library, a 44,000 square foot, state-of-the-art facility. Library Square also includes the Aurora Seniors’ Centre, Church Street School, and Victoria Hall. The Aurora Factory Theatre located at 150 Henderson Drive hosts an excellent line-up of plays and musicals, as well as offering educational workshops and social events. The Town of Aurora hosts many annual events including: The Aurora Home Show, the Aurora Horse Show, a special night time Santa Claus Parade and July 1st Canada Day Celebrations. York Region Transit provides excellent coverage throughout Aurora, including direct links to major shopping centres and community facilities. Go Transit bus service along Yonge Street connects passengers to the Finch subway station on the Toronto Transit line. The historic Aurora Go Train station located at Yonge and Wellington Streets offers three daily commuter trains to downtown Toronto’s Union Station. This train ride takes approximately one hour. Highway 404, which runs along Aurora’s eastern border, merges into the Don Valley Parkway that feeds right into downtown Toronto. Total travel time is approximately one hour. Yonge Street and Bathurst Street, provide alternative scenic routes into the City of Toronto. Richmond Hill began to take shape in 1801, when Abner Miles settled a parcel of land fronting on Yonge Street at Major Mackenzie Drive. Richmond Hill’s strategic location between the City of Toronto and Lake Simcoe made it a popular stopover in the 1820s, when a stage coach line began operating on Yonge Street. To accommodate this increased traffic; Miles, operated an Inn that was popular with weary travellers along the busy Yonge Street corridor. Miles also operated a general store and an ashery. His son James, would later donate land for the first church, and school in Richmond Hill. In the 1830s, a post office was added, and the name of the community was changed from Miles Hill (and later Mount Pleasant), to Richmond Hill. The origin of the name Richmond Hill may have stemmed from a visit by Charles Gordon Lennox, Fourth Duke of Richmond, and a Governor General of Canada. Still others believe the village name may have originated with the local school teacher Benjamin Barnard who taught his pupils to sing ‘The Lass of Richmond Hill’, recalled from his childhood days in Richmond, Surrey, England. In 1873, Richmond Hill was officially incorporated as a village. Richmond Hill rose to national prominence in 1912, when it was recognized as the “Rose Growing Capital of Canada”. During this period some four million roses were grown here annually. Post World War II growth resulted in new housing developments in Richmond Hill, and a dramatic growth in the population. This led to the incorporation of the Town of Richmond Hill in 1957. Richmond Hill, south of Elgin Mills Road is completely urbanized. 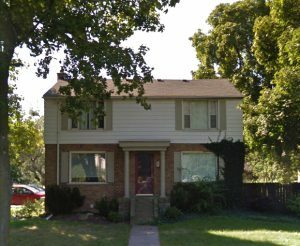 The subdivisions in this part of town have fairly high densities and include: detached homes, semi-detached homes, freehold townhouses, condominium townhouses, and link style homes. Many of these subdivisions are buffered by greenbelts and conservation areas. There is also an ever increasing number of condominium apartment buildings located along the Yonge Street corridor. Many of Richmond Hill’s newest subdivisions are being built in the Oak Ridges community off Yonge Street, north of Stouffville Road. A great deal of planning and thought has gone into these developments which are situated in the picturesque but environmentally sensitive Oak Ridges Moraine corridor. Richmond Hill’s heritage homes are situated in the downtown core at Yonge and Centre Street. The whimsical Ontario Cottages, and Board and Batten style homes found here, date back to the mid 1800s. Heritage plaques mounted on the front of these homes provide details on when they were built, who the original owners were, and their respective vocations. The Mill Pond community at Mill and Trench Streets, is situated just to the west of the aforementioned heritage district. This well-treed community has a pond as its focal point, and features big lots with ranch-style bungalows, and split-level houses, built in the 1950s and 60s. Yonge Street serves as the main shopping corridor in Richmond Hill. 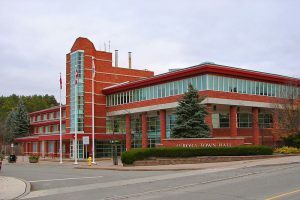 Downtown Richmond Hill, situated on Yonge Street, north of Major Mackenzie, has the look and feel of an old fashioned main street. Here you will find a plethora of shops, restaurants and professional services. Further north on Yonge Street at Carrville Road is Hillcrest Mall. This regional shopping centre has recently undergone extensive renovations. Hillcrest Mall is anchored by: The Bay, and Zellers. In addition there are over 130 stores inside this shopping mall. Further north on Yonge Street in Oak Ridges, are a string of shopping plazas which serve the everyday needs of local residents. Richmond Hill’s newest shopping destination is the Bayview Glen Power Centre, located at Yonge Street and Highway 7. This shopping destination features ‘big box’ retailers including: Home Depot, Sears Furniture, Indigo Books, restaurants and movie theatres. 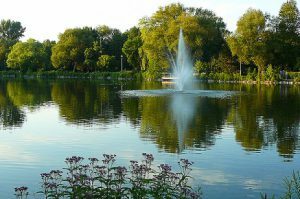 Richmond Hill has over 100 parks and natural areas, 5 golf courses, and 18 recreational facilities. Richmond Hill is well known for its outstanding figure skating and hockey programs. Many of these programs take place at the Elvis Stojko Arena. This arena is named after world champion mens figure skater Elvis Stojko, who grew up in Richmond Hill. Sunset Beach Park on Lake Wilcox at Bayview Avenue and Bloomington Road is a popular waterfront recreational spot. This municipal beach is the home of the Richmond Hill Canoe Club. Phyllis Rawlinson Park at Leslie Street and 19th Avenue is an 89.5 acre conservation area willed to the Town of Richmond Hill by Phyllis Rawlinson, who served in the Womens Royal Naval Service during World War 11. Rawlinson also gained distinction as a champion equestrian and one of Canada’s first women polo players. Arts Richmond Hill’ is a non-profit organization supporting Arts and Culture in Richmond Hill. The Festival of Lights, Music Festival and Heritage Village Day are some of the annual events sponsored by this organization. The Richmond Hill Group of Artists is based at the Mill Pond Art Gallery located at 314 Mill Street. Adult and children’s art classes are offered here. The Richmond Hill Garden & Horticultural Society holds an annual Autumn Flower Show at the McConaghy Seniors’ Centre. This show is always well attended. The Richmond Hill Historical Society invites you to visit the Historical Burr House, located at 528 Carrville Road. This heritage home was built by Rowland Burr in 1820. While you are there you may want to tour their craft gallery for one-of-a-kind gifts. Richmond Hill has three public libraries: The Central Library located at 1 Atkinson Street, Oak Ridges Moraine Library at 13085 Yonge Street, Unit 12, and Richvale Library located at 40 Pearson Avenue. The Central Library located on the southwest corner of Major Mackenzie Drive and Yonge Street, is a 60,000 square foot, state-of-the-art facility, with a collection of more than 175,000 books, videos, and CD’s. For entertainment: be sure to visit the Lois Hancey Aquatic Centre located right next door to the Central Library. This aquatic centre is unique within the Greater Toronto Area. It includes a wave pool, 160 foot water slide, swirl pool with water jets and sprinklers, rain cloud with thunder and lightning, and an on-deck sauna. Astrology enthusiasts will want to visit the David Dunlap Observatory located at 123 Hillsview Drive. The University of Toronto operates this observatory for research in astronomy and astrophysics. The public is welcome to tour the facilities and have a look through the telescope on Tuesday mornings and Saturday evenings. Richmond Hill is well served by York Region Transit which operates extensive bus service throughout this town. Go bus lines operate along Yonge Street and Bayview Avenue, connecting passengers to the Finch Subway Station on the Toronto Transit system. Local Go train service is available from the Newkirk Road station just north of Major Mackenzie between Yonge Street and Bayview Avenue. The Go train ride from this station to Toronto’s Union station takes approximately 40 minutes. Richmond Hill motorists can easily access north-south corridors including Yonge Street, Bathurst Street, and Bayview Avenue. For commuters looking for a quicker route into Toronto try Highway 404, which can be accessed from the east-end of town. The much anticipated Crosby Park has reopened and there’s something for everyone to explore! No ordinary park, Crosby Park has been re-designed for inclusive recreation and now everyone, from the able-bodied and physically challenged to those with sensory and cognitive impairments, and even seniors, can enjoy the simple pleasures of outdoor recreation. The first of its kind in Richmond Hill, Crosby Park (located at the corner of Newkirk Road and Crosby Avenue) provides a variety of recreational activities, personal enjoyment and socializing for all ages. The park’s design interprets diverse landscape types including forests, meadows, dells, hollows, ponds, rivers and valleys to create a stimulating and fully accessible outdoor recreation environment. Mill Pond was named in recognition of the sawmill operation that used this pond for power. The sawmill is an important component of Richmond Hill’s culture heritage because it was part of what made the heart of Richmond Hill an attractive place to settle in the late 1800s. Mill Pond Park is stage to the popular summer Concerts In The Park, and it also hosts the annual Winter Carnival and Mill Pond Splash Events. South of Mill Street, visit the Millennium Garden and find your way to the Museum of the Streets (look for the sign). Resident waterfowl are another reason that Mill Pond Park is a favourite for many. Please help keep our wildlife wild by not feeding the birds. The Pond Story told on signs in the park, explains why feeding Canada geese is harmful to them and to the environment. Thornhill’s first settlers arrived in 1794. It was a settler named Asa Johnson who settled on the Vaughan side of Thornhill. The community takes its name from Benjamin Thorne who settled here in 1820. Thorne operated a gristmill, a sawmill, and a tannery in the area. Not surprisingly the settlement became known as Thorne’s Mills, and subsequently Thorne’s Hill, and finally Thornhill. 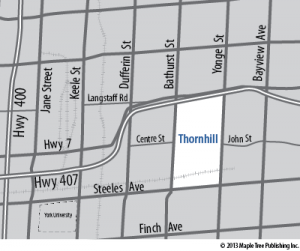 Thornhill’s location along Yonge Street was a major impetus for its growth as it provided access to the City of Toronto to the south. This access was acclerated with the arrival of the electric street railway along Yonge Street in 1898 and further enhanced in the 1920s, with the arrival of the automobile. Thornhill has always belonged to two diffrent municipalities. West of Yonge Street is in the City of Vaughan and east of Yonge Street is the City of Markham. This separation has not stopped Thornhill from establishing its own identity as a community. In 1931, Thornhill became a “Police Village”. The creation of the Police Village gave Thornhill its own political boundaries. The village was headed by a reeve. When York Region was created in In 1971, the Police Village of Thornhill was dissolved. However; Thornhill would retain its village identity in part thanks to the post office which retained the Thornhill name and serviced homes and businesses within the former village’s boundaries. Thornhill has expanded northward over the years. The Thornhill name has been used to denote many of the new subdivisions that have sprung up in the area. Today, in Old Thornhill along Yonge Street, over one hundred historic buildings stand as reminders of Thornhill’s past. The Thornhill Historical Society has commemorated fifteen sites with historic plaques. The Thornhill Village (Wheatsheaf) Festival was started in 1977 in part to draw attention to the “Old Town”. Both sides of Thornhill are designated as Heritage Conservation Districts. Thornhill has one of the highests densities of any neighbourhood in the GTA. There is a new home subdivion in Thornhill to suit just about everyone’s taste and budget. There is also a wide selection of condominium buildings and townhomes to choose from here. 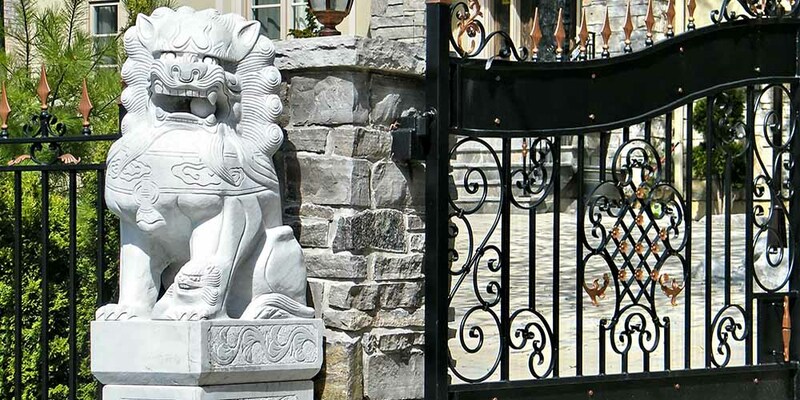 Thornhill has some palacial executive homes on premium lots in enclaves such as Bayview Glen, Olde Thornhill, and Westmount. At the north end of Thornhill, the massive Thornhill Woods subdivision north of Highway 407 between Bathurst and Dufferin Streets has proven to be especially popular with young families. The Promenade Shopping Centre located on Bathurst Street in Thornhill is a shopping destination anchored by Sears. It has over 175 shops including popular names like: Old Navy, American Eagle Outfitters and Coach. Thornhill has an excellent mix of indoor and outdoor recreation facilities: The North Thornhill Community located at 300 Pleasant Ridge Avenue offers a myriad of amenities that include: Cycling studio, aerobics studio, sauna, swimming pool and whirlpool. Pay-as-you-go and membership options available. There are also a number of culture and faith based centres available to residents. The Thornhill Park Tennis Club located at 26 Old Yonge St is one of the most active tennis clubs in the City of Vaughan. The public parkland surrounding these courts makes for a pretty setting. Golfers will delight in having so many courses to choose from in Thornhill. These include the Uplands Golf and Ski Club, The Bayview Country Club, and the The Ladies’ Golf Club of Toronto. The City Playhouse Theatre located at 1000 New Westminster Dr., showcases both professional and community based theatre, performances in dance and music from professional and community based production companies, art exhibitions and multicultural events. Theatre education and outreach programs are also part of the City Playhouse mandate – opening their doors and establishing long-term connections with the community. YRT/Viva offers local and rapid transit services in the Thornhill area, For more details visit http://www.yorkregiontransit.com Go Transit also has a bus station at Yonge St. @ Langstaff Rd.